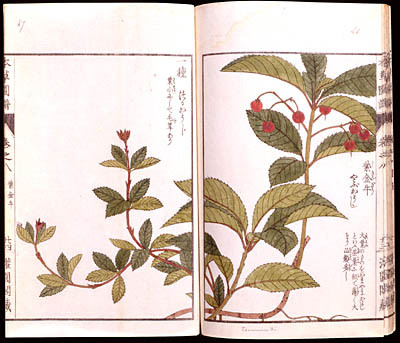 This work, the preface of which is dated Bunsei 11, or 1828, is a treatise on flora, adopting the plant classification of Li Shi zhen’s Pents’ao kang mu (Benzao gangmu) published in China in 1596. The specimen in the library consists of 87 fascicles (out of the 91 published); certain volumes are wood block printed and hand coloured while others are manuscript in a wood block printed frame. The fascicles, generally in excellent condition, come from the collection of Dr Ludovic Savatier (1830-1891) who, from 1866 to 1871, was the doctor at the French-built Yokosuka arsenal.